We have updated our biggest app: “LetterSchool – Learn to Write!” and it’s our greatest update yet! We added a new component: “Learn to Spell” with 150+ words in English for kids to learn to sound out! We changed the initial game selection screen so it’s much easier to navigate between different components. We did this based on the feedback we were receiving from many users who found it challenging to access different screens. After careful consideration, we came to the conclusion this would be the best solution as now it is very easy to access each part. The first screen our users can see now is the game selection where one can easily choose to play with either block letters, numbers, or freshly added CVC words. We designed the screen this way as it is self-explanatory and from the UX/UI perspective, it will reduce uncertainty. In the past, new users who didn’t know they could swipe between the screens to access different components were immediately deleting the app as they assumed it did not contain enough content, while in fact it did and it remained undiscovered. With the update, it is much less likely to keep all of the educational content of the LetterSchool app unnoticed and it makes our users’ experience easier and flawless. Plus the visuals in the form of the flashcards come handy to switch between the elements! It’s now visually attractive and easier to understand how to switch between what you want to learn: starting with shapes, through block letters (upper- and lowercase), numbers, cursive letters, CVC words, CVCC words, to long sound words. For those users who previously paid for a bundle within the app, we provide them with the full version of the refreshed app free of additional charges. It’s a gift from us to everyone who has committed to the LetterSchool in the past. We removed the single bundle options from the app so now the paying customers can upgrade to the full version with all the elements in it at once. For new users, we kept the “demo” version so that they can test the app for free and see if they are interested in purchasing the full version. 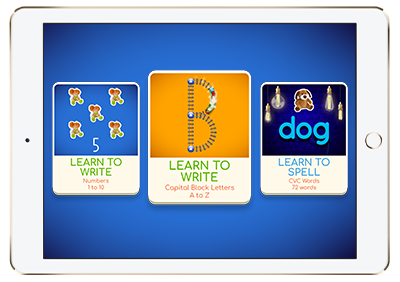 The app can be fully played on three steps with the letters A-E (on two levels: silver and golden) and with three CVC flashcards (with a total of 9 CVC words!). We believe this is enough content to test before purchase-decision and accurately shows how the app works. Users who paid in the past can simply restore their purchase in the ‘shop’ window. We are already working on adding more stuff to our app – currently, users can see three new flashcards presenting the ‘Coming Soon’ teaser and we’re really than excited to share our ideas and designs with our beloved LetterSchool parents and teachers. This way, we want to make sure that children can play with the LetterSchool app for longer, adapting to different ages. We want to become the best educational app developer with a focus on all literacy skills! If you own the “LetterSchool – Learn to Write!” app, we strongly recommend you to update the app to get access to the best educational supplement tool your child can learn with! You can use this link to update your app. If you don’t have our app yet, use the button below to download it now and boost your kids’ literacy skills with LetterSchool!